Hey everyone! Welcome to my blog. :D I write about all sorts of creative topics especially fashion design, art, crafting and more! Take a look around by clicking on the labels to the right or seeing the most popular posts listed on the left! Hopefully you'll be inspired to get creative! My highlights include being featured on http://cathycassidydreamcatcher.blogspot.co.uk/ and having Paperchase comment on my post! Enjoy! Hello Everyone! 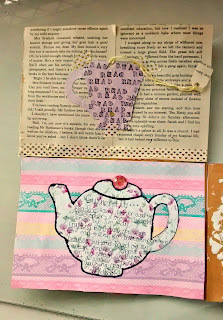 Today I'll be showing you a tea party themed happy mail swap I did recently. If you're not familiar with the term 'happy mail swap' it means that you and someone else both send a parcel along with a letter to each other, often with a theme. 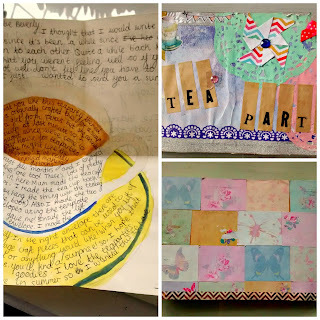 Normally both parcels are sent at the same time but in this case, I sent a teaparty themed happy mail and then got one back in return soon after. I hope you enjoy taking a look at what I have created and what I received as a reply! 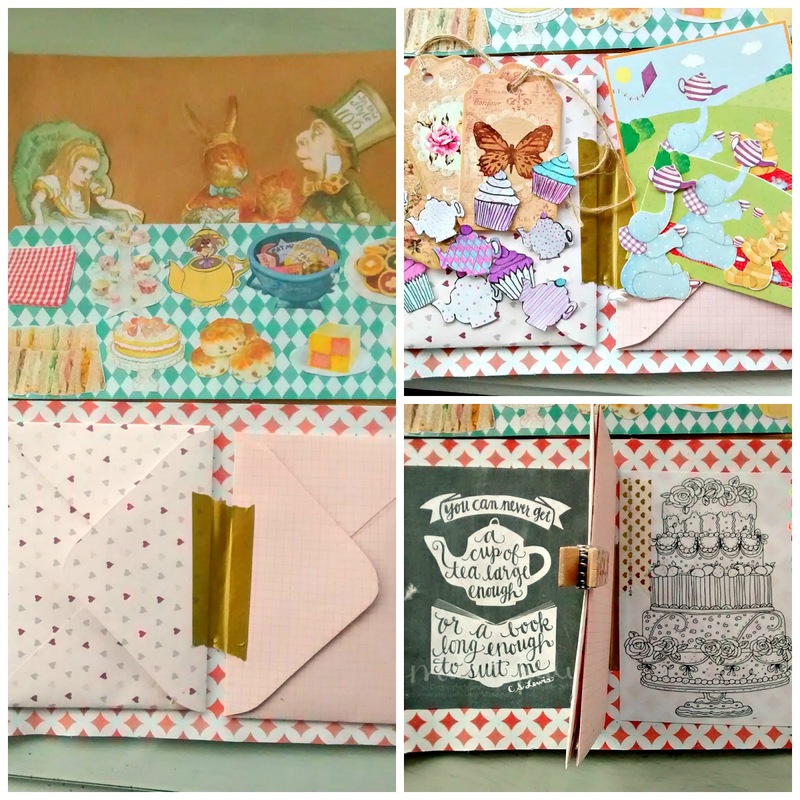 For my tea party themed happy mail (the one I made and sent out), I created a flip book. I used A5 pieces of card that were sellotsped together so they could fold into a small shape or open out into a large, interesting piece of happy mail. I used lots of different papers and embellishments. You can see in the collage above, just one page of the flip book that I've photographed in 3 different ways. I created 2 mini envelopes and filled them with goodies. In one envelope I put handmade stickers and some pretty gift tags that I bought in there. In the other I put elements of a decopague picture in there. They could fold back to reveal a quote and a colouring page. In this collage you can see the front cover, the back cover and the letter. I wanted everything to tie in with the tea party theme or at least tie in with the pastel colours I used throughout. That's why I thought carefully about the design on the writing paper. I was inspired by a picture I saw on Pinterest of some beautiful writing paper to create my own teacup writing paper with watercolour paint. The back cover was decorated with pretty sticky notes that I stuck down to create a pattern. Also, the front cover was created with all sorts of embellishments along with a pretty piece of paper. 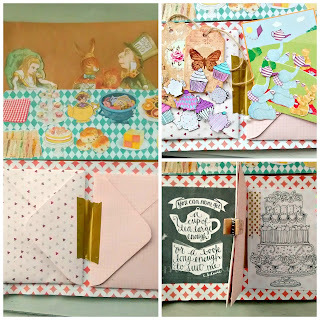 I wanted this flip book to be full of handmade delights so I made this teacup bookmark (on the top page) out of paper, alphabet stamps and string to fill the flip book. The bottom page has a currently section which if you didn't already know, is a place where you write everything that you've been up to recently e.g what you've been reading. Here's what you see when you first open the flip book. On the left hand side of the page, there's an envelope where the letter goes in (that you saw earlier). 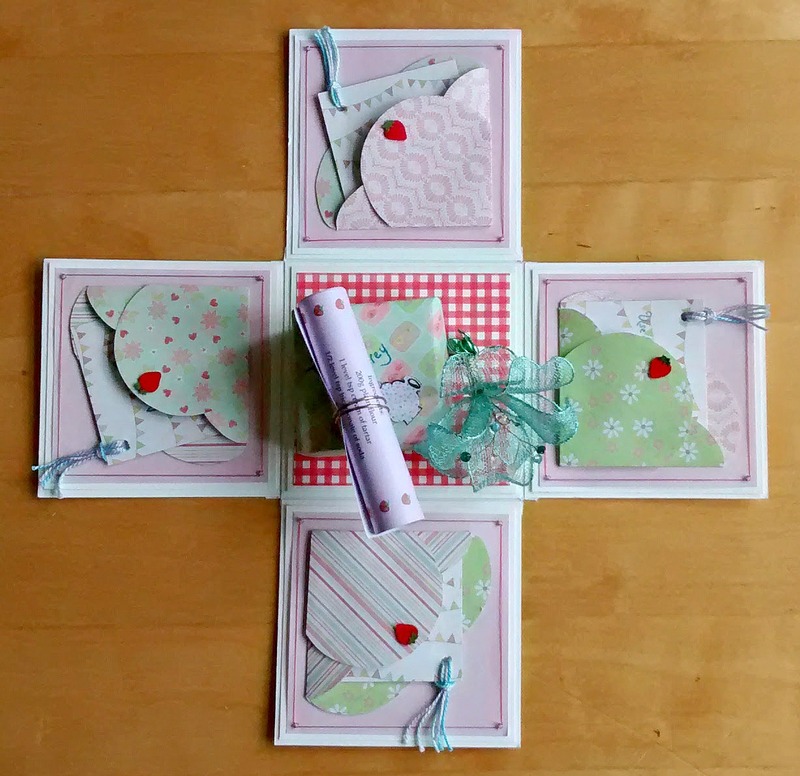 I chose a beautiful envelope that came with a writing set which acted both as an envelope and as a decoration. On the right hand side, I used a mandala stencil and acrylic paint to decorate the card and I put some handmade teacup hairclips on it as a goodie. Now here's the incoming teaparty themed happy mail. 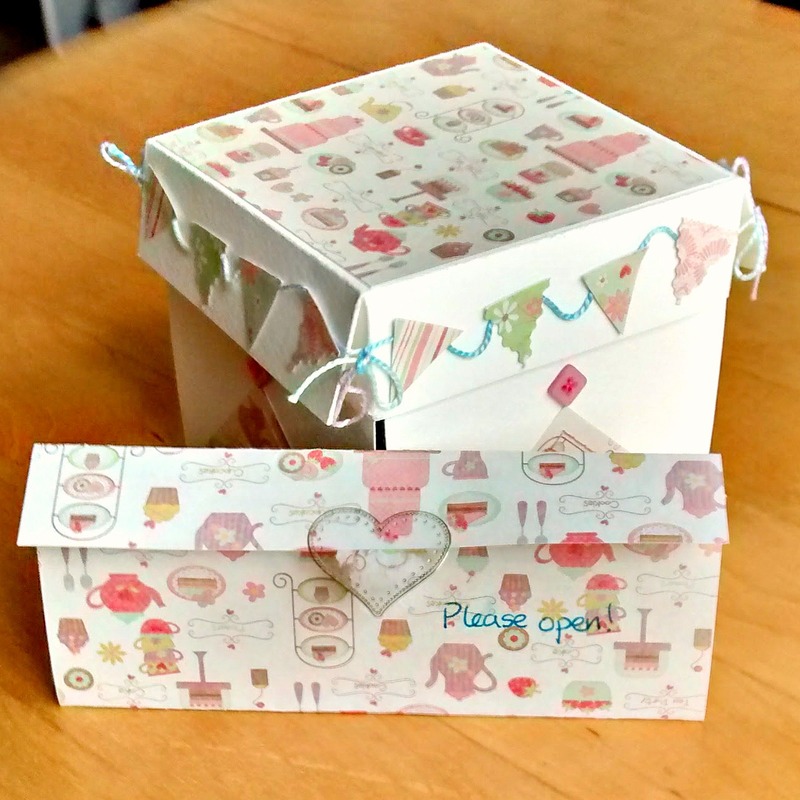 It's made with gorgeous tea party patterned paper. This is called an exploding box because when you take the lid off it unfolds! It was really exciting to open the box and even the letter opened up really beautifully since it was sealed with a sticker. Here's what I saw when I opened the box, it's gorgeously handcrafted with scalloped pockets on each square and beaded and threaded borders on each square. The colours scheme is super cute and I was giddy when I saw the pretty goodies which you'll see better in the next photo. Here's the goodies that were sent to me. 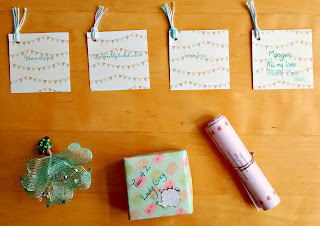 Along the top are handmade gift tags with cute tassles in pastel threads and sweet notes on each tag. I think I'll keep these in the box instead of using them on gifts since they're too pretty to use! On the left is a handmade 3D brooch which is a turquoisecrafting The person I received this from is my Auntie Beverly who does bead and wire crafting so this is made very professionally and I can imagine it took her hours! 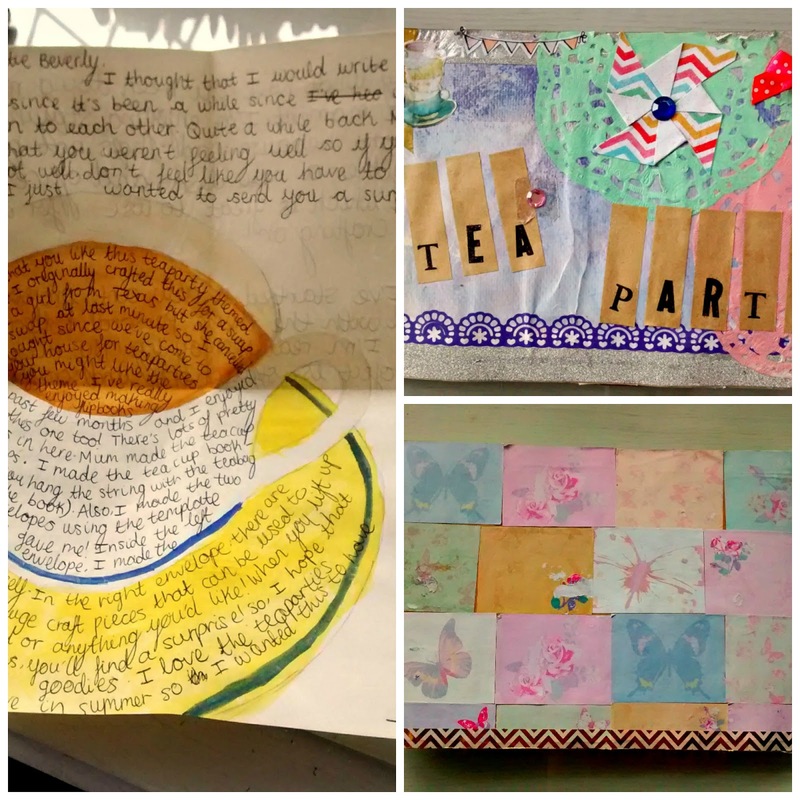 In the middle is two lady grey teabags in an origami box she made with a sticker on that I sent her. Then there's a rolled up recipe for strawberry short bread that is so cute. I look forward to making it soon! So that's the tea party happy mail swap! It was so fun to make the flipbook and I love love love the exploding box I got in return! I recommend doing a happy mail swap if you're bored or you want to try out a craft project! It's fun to pick a theme to do with your penpal whether they're a friend or family member! Have you ever done a happy mail swap? Did it have a theme? If so, what was it? I'd love to know! Or have you ever have a tea party? What did you eat and drink? Let me know in the comments! I nominated you for The One Lovely Blogger Award! All details on my blog! Wow this is a really fun happy mail theme Megan! I always love seeing the kinds of happy mail swaps you're up to since I'm still getting used to the idea! The third section is super cool! Did you buy the alphabet stamps from The Range by any chance? (I'm just curious since I bought mine there. xD) A currently section is also a really inspiring idea, I'll consider that! Thank you-I love looking at happy mail swaps too! Yes Pinterest is amazing for happy mail inspiration. YouTube is also great too, although I find it difficult to find YouTubers with my happy mail style (but I like: MyGreenCow, Little Hot Tamale,Sabrina Ann and Serena Bee Creative). 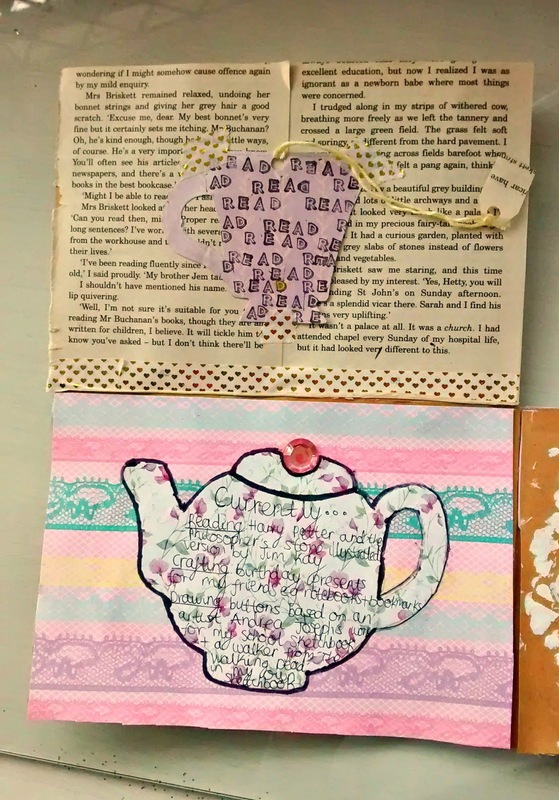 Funnily enough I found that teacup writing paper idea on Pinterest (actually I mentioned that didn't I? xD).I tend to get most of my embellishments from 'The Works' and 'The Range' but sometimes I get things like stickers from 'Paperchase'. Also, penpals send me embellishments which I don't have in my collection which are fun to use (or just hoard hehe). Yes I did! Wow using hole punches to make a mandala stencil is a genius idea! I might try that out! I think the reason it looks so professional is because she sells her crafted items and this was something she made but didn't sell. Her crafts are gorgeous, I agree! She sent me a seaside themed happy mail last month which is also amazing! I'm crafting a reply to it today. I think I might post that swap soon! Megan, this is really inspiring! Would you like to be my pen pal? Thanks Megan, I understand that GCSEs can be super hard to balance with more pen pals. Sure, we can talk about penpalling when they are over! Any ideas, feedback or praise? Select 'notify me' so you know when you get a reply from me or someone else.